As you might have guessed from all our posts, Managing Editor Eric Rosen and I had a fantastic time on our trip to Australia last month, so we were excited when we found out about a huge promo that Virgin Australia, Delta and Tourism Australia are teaming up on called “52 Somedays” where flyers can win one of 52 week-long trips to Australia. 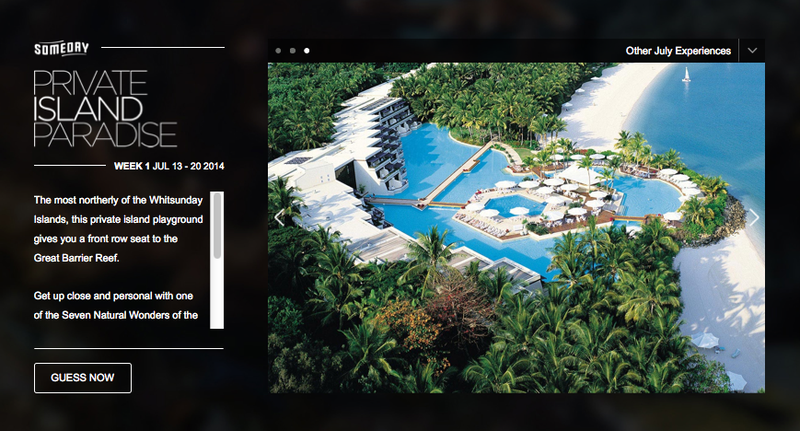 In order to participate, you must visit the 52 Somedays site where you can click through any of the 52 experiences – including photos and videos that are clues as to where each particular experience is taking place. When you figure it out, place a pin on the Australia map as your guess and if you guess correctly, you are entered to win that particular Someday trip. There is a little slideshow and a clue that includes the following text: “The most northerly of the Whitsunday Islands, this private island playground gives you a front row seat to the Great Barrier Reef,” as well as a video with a Virgin Australia flight attendant talking about the destination. When you know where it is, you click on the “Guess Now” button. 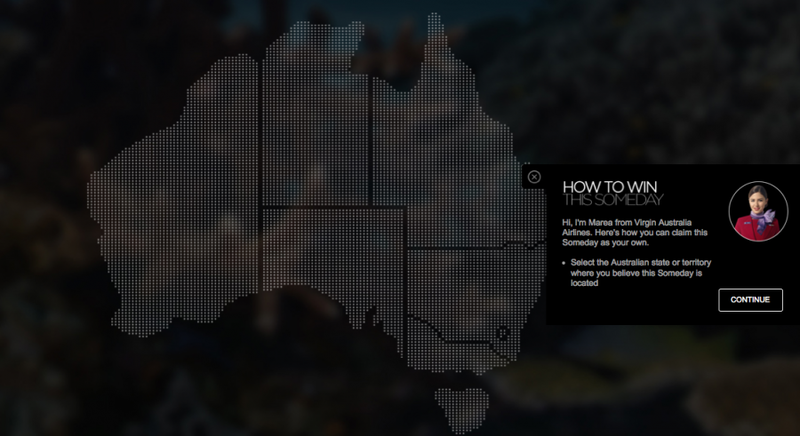 Then you’re taken to a map of Australia where you must guess the State or Territory where the experience is. Then you get to a more detailed map where you must drop a pin as close to possible to the location where you think it’s taking place and if you’re within 10 miles of the correct answer, you receive one entry into the random drawing for that experience. If you’re not within the 10-mile radius, you are given an entry into a second chance giveaway. You just have to enter your personal information and that’s it. It’ll take a while to go through all 52 – but hey, there are a lot of prizes, so if you have time and are interested it might be worth it, and it definitely is a way to indulge your armchair wanderlust. The other packages include Outback adventures, wine-tasting, rainforest explorations, train treks, beach getaways, city vacations, foodie safaris and more – all in all, a great collection of experiences throughout the country. The contest will be running now through 11:59 ET on April 21, so be sure to get your answers in by then! Per the terms and conditions, the contest is open to legal residents of the 50 US states and Washington DC who are 18 or older. There is a limit of one guess per experience per person/email address. At the end of the promo period, there will be a random drawing for each experience and winners will be contacted by phone or email. Economy Class air travel for winner and guest on Delta Air Lines from airport served by Delta closest to the winner’s residence (as determined at the sole discretion of the Sponsor) to LAX Airport on Delta Air lines. Two (2) round trip airline tickets for winner and guest from LAX airport to Sydney, Australia on Virgin Australia. Two (2) round trip airline tickets for winner and guest from Sydney to the Experience) on Virgin Australia (if required) – based on the valuation of the prizes, this looks to be in economy class. Seven (7) night hotel accommodations as per the trip package itinerary (one room, double-occupancy) in hotels determined at the sole discretion of the Sponsor in that Experience location. One (1) Australian Experience which varies for each weekly prize. You can find the week allotted to each experience in the T&C appendix. Be sure you enter your Delta SkyMiles number on your reservation if you win so you can rack up the miles on your trip on both Delta and partner Virgin Australia. The prizes also include seven nights’ hotel accommodation per the details of the experience package (one room, double occupancy). Have a look at the appendix of the T&C as well as the experience dates as you’re looking at them because those are the dates of that particular prize – so if you can’t travel those dates, you’re out of luck. One more thing to note – as with many contests, winners are responsible for taxes. 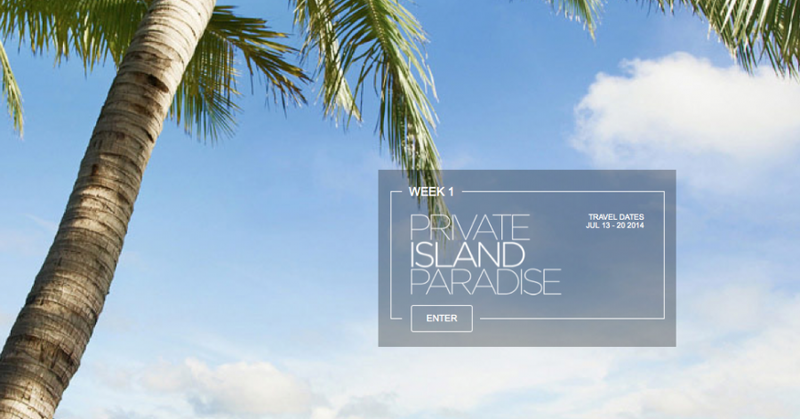 In this case, each experience is valued at $7,875, so just be aware of your tax bracket and the percentage you’ll have to pay, which is up to 35% of the value of the prize in some cases. See my post on Travel Contests and Tax Consequences for more info. Taxes aside, it looks like there are some really great experiences here, and looking through them makes me want to start planning another trip down under already. If you do enter, let us know which experiences you’re interested in and why in the comments below, and more importantly, let us know if you win! Good luck.